We did it! My husband, Billy, and I finally got our first Coast to Coast--and yes, I say first because we are already planning for next year. 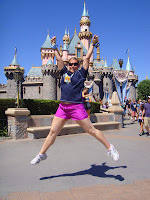 So here it is, my race report of the Disneyland Half. Corral B...I'm a happy girl! Waiting in line for the expo to open. We drove into Anaheim Friday night, so this was our only chance to get to the Expo. 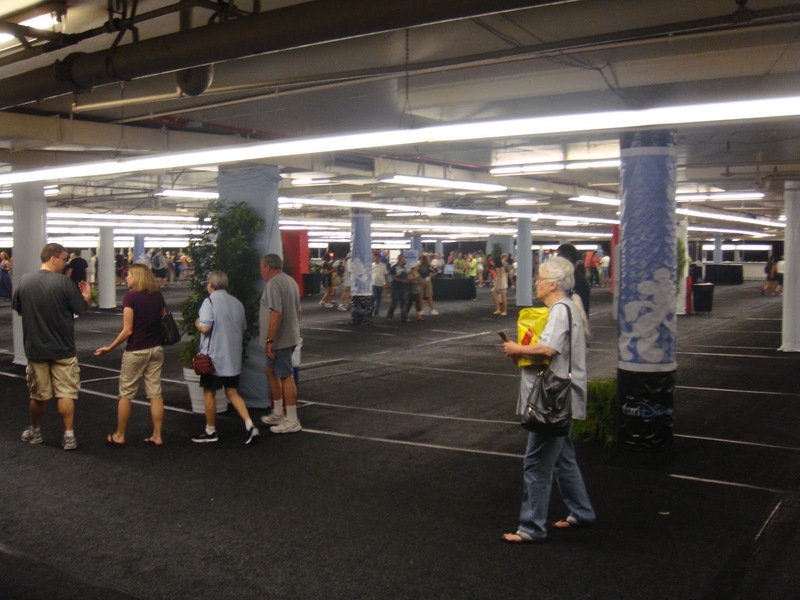 After being at both Disneyland and Disney World, this expo is a lot less crowded and gives you a chance to actually shop. 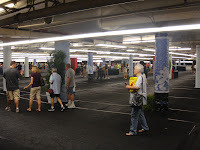 Last year in Florida, I got so claustrophobic I couldn't spend my hard-earned money (hmmmmm....maybe that one IS better). Anyway, I digress. We waited a short time in line before heading in to pick up our bibs, park tickets, pin, and goody bag. 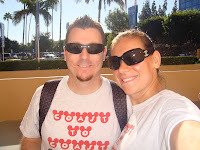 I was all about getting to the parks, so I had our waivers printed and signed, so we headed straight to pick up the bibs. My number was about 600 people worse than last year, so I was a little nervous, but B is for BRAGGING RIGHTS!!!! Yes, I made it to corral B. Now, I'm not a super fast runner, so corral A is a bit out of reach for me, so B is my proud, shinning moment. 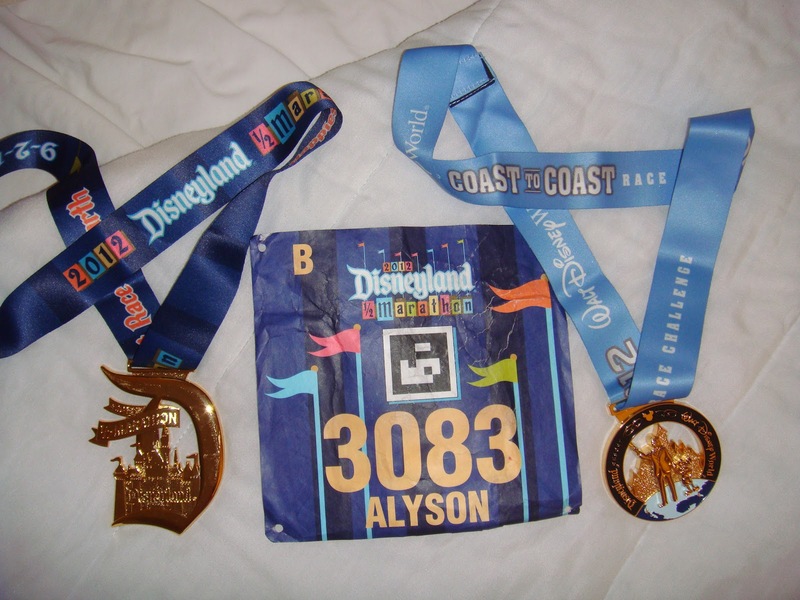 So, got my bib, got my bracelet for my coast to coast medal, got my pin, and got my park tickets. Disney has all this in a separate room, which makes it nice to actually be able to breathe while you do all of this. Then, onto the big ballroom, i.e. where I spent my hard-earned money :) Got our goody bags and shirts first. Now, I'm not saying I love all the junk that usually ends up in the bags, but really? Was it just because we came Saturday? My bag was "full" of...well...one mini Clif bar and my safety pins. That was it. Guess it left less junk to get rid of at the hotel. 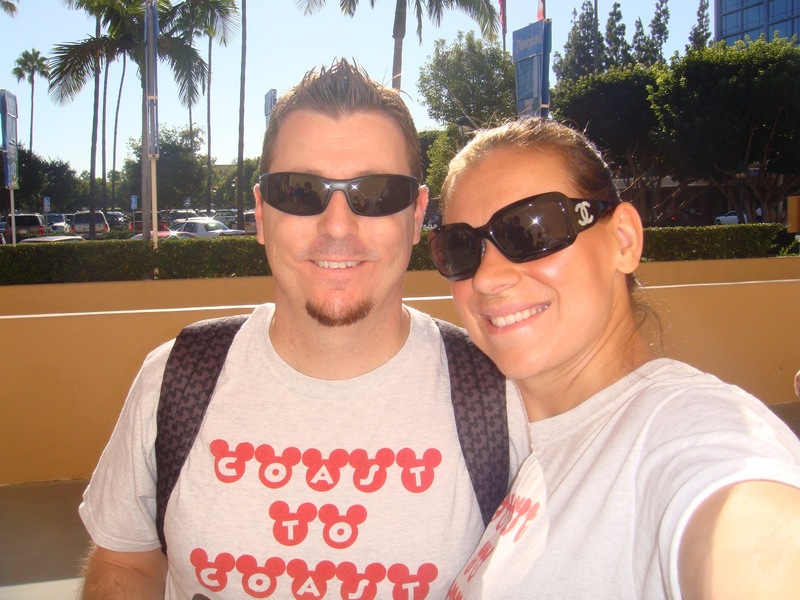 Shirts were cute, pretty standard for Disney. I love that they give you tech shirts and not t-shirts. They last so much longer and don't end up looking all worn after a few washes. I do, though, wish they would get away from those dark colors. Wearing it to the parks in 90-degree heat is tough. After getting all the essentials, it was time to SHOP! I love this part, can't you tell? Just like in every other area of vacationing, Disney has merchandising down to a science. I wanted everything. I did, though, have some specific things in mind. First was the Coast to Coast sweatshirt I was pining over in Florida. There, they had many available, but there was a printing error and I didn't want to spend $50 on a sweatshirt with an imperfection. I found it here, but only in XL and S; I'm not a small. So XL is was, and we justified it by saying we'd "share" the sweatshirt. 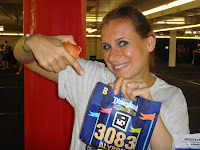 Also picked up another car magnet to match my 26.2 and a Disneyland Half Marathon "I'm only half crazy" shirt. We shopped around for a while, picking up another shirt from One More Mile (I just love their stuff!) and Billy bought the Jeff Galloway "run-walk-run" clock. By the way, if you use that method, this thing is the best! It's loud and vibrates. Billy loved it & I think I'll be using it during the full marathon in January. Being at Disneyland, I have a hard time sitting and listening to the speaker series, although there are a lot of great speakers. We got to hear Jeff Galloway while we shopped, picked up some good pointers and heard some great questions from the audience. Billy had to register with the run tracker for his facebook (I did that at home), so we quickly did that, took a few more pictures, then headed out to the parks. We woke up early to get ready for the race. We stayed at the Tropicana Inn & Suites, which is right across from the entrance. We can usually stay at the Hilton for free, but figured it would be well worth the money to be about a mile closer to the start line. 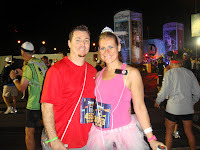 Starting time was 5:45 am, so we headed out at 4:30 to be sure to have time to check our bags, get into our corrals (B...Bragging rights, remember? ), and make the ceremonial last Porto-potty stop. 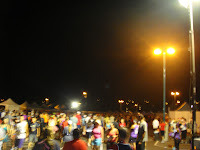 There was a bit of a jam up as we walked to the corrals, which we never experienced before. We squeezed into the corral just before 5:30. It was jam packed full already. If there was any negative to a Disney race, it is that there are tons of people running. National Anthem, fireworks, wheelchair racers, corral A, THEN...we're OFF :) I will say, that first mile was rough. It was so crowded you couldn't get off to a good pace. This was the beginning of my not getting a PR (personal record, as my mom finally asked "what the heck is this 'PR' thing"). Hit mile one and my watch said something like 10:40...UGH...it should have said 9:32. Grrrrr.... Well, I felt good and was having fun, so I just made my mind up that I'd have to make up about a minute throughout the rest of the race. Miles 2 & 3 are inside California Adventure and Disneyland. We entered CA by the World of Color, which was playing. I promptly turned off the i-pod and enjoyed the "Disney-ness" of the race. Too bad I had to make up time, because this is the best part. We then got to run down Radiator Springs/Cars Land. What a great scene...looks just like the movie! Then we swiftly ran into the Disneyland Park. 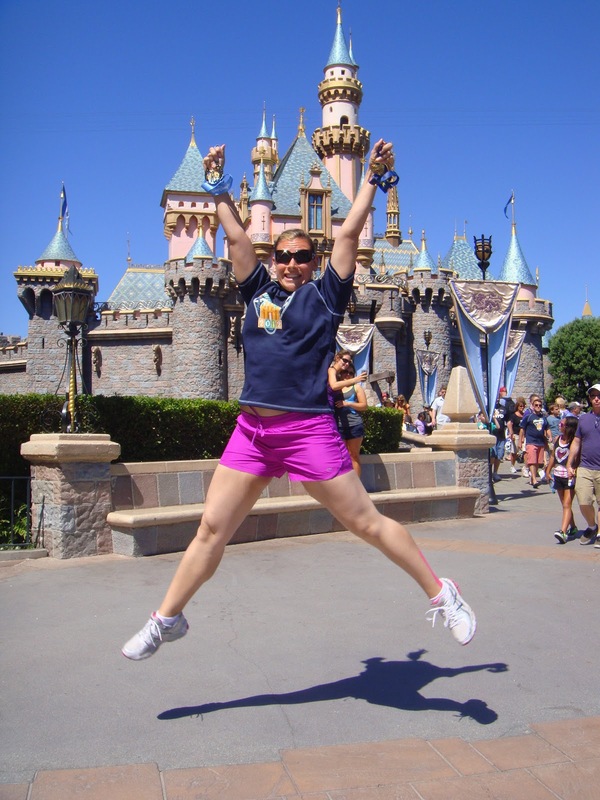 This year, they looped us around a little differently with the addition of Cars Land, but we still got the usual thrills--running down Main Street USA, going through the castle, and tons of characters. Because I was still in "running for a time" mode, I didn't stop for pictures, but I enjoyed as much as I could flying by. You hit about 3.5 miles...and then you're on the streets of Anaheim. I've always said the city does a great job with bands, cheerleaders, dancers, etc to line the course. They produced again this year, giving nice breaks to the somewhat boring course. They added a car club (maybe to go with the Cars Land stuff? ), but I have to say, it was a long, boring stretch of cars. It kind of bummed me out too, because from afar, it looked like a water station, but it wasn't. Kind of a half-marathon mirage. I thought I was coming up on a water break, but it was just a bunch of old cars. Now, if I was a car person, this might have been great, but it was just too long of a stretch with not much cheering or excitement. Somewhere on the streets you hit the 10k mark. Check the watch. Do the math. I'm on my way to a PR!!!! Not the 2:05 race I was hoping for, but a solid minute improvement from my best time. Just don't know if I can keep it up. My legs are starting to get tired. There is about 5 miles where the only glimmer of hope is the run around the Honda Center. You don't go in, but at least you can say you ran around it, right? Then you hit mile 9, the Clif shot station. I hate gooey shots. They turn my stomach and I was already feeling nauseous from these antibiotics I am on, so this was not a stop for me. After the race, Billy bragged about the kick it gave him, and the energy he had to finish strong. Maybe this is something to consider for the future, because I could have really used a kick! Then it was a quick stroll into Anaheim Stadium. This is another highlight. It's loud, fun, exciting. You really get a good burst of energy running those bases. I was starting to fatigue, both physically and mentally at this point. I didn't even look up to find myself on the jumbo-tron. You hit the 15k mark right before you enter the stadium. Again, watch, math, PR is in reach! You exit the stadium through an underpass with a pretty steep hill (at least it is when you've just run 10 miles). Then some more boring streets. This was the point I hit the wall. Not as much as when you hit it during a marathon, but I just didn't have anything left in the tank. I didn't want to add more PowerAde & water, as my stomach was already feeling like crud, but I had little left. The sugar probably would have helped, and in hindsight, I felt fine the rest of the day, so I probably could have had a little more. Run, take a 30 second walk break, start up strong, need another walk break, long walk through the hydration stations, run some more, talk to yourself, check the watch, do the math, my PR is slipping away. It was a little heartbreaking, but I felt good. I had a rough month leading up to this race health-wise, so I am proud of what I was able to do so far. During mile 10, I figured I was off my PR, so just enjoy, coast, and finish strong. And then it happened...the girl next to me told her friend "We only have one more mile. You can do it." What?!?!?! One mile?!?!?! I thought we were still on mile 10?!?!? Then I recognized that last turn into the Disneyland Resort. I know this part of the course. Mile 12 is up ahead. I completely missed the 11th mile. I was coasting and walking when I should have been pushing for that PR. I wasn't as far off as I'd thought. Going through mile 12 was tough. I tried to push, but the tank was really empty at this point. I smiled through the end, ran through the finish, and happily walked, upright and feeling great, to grab my drink, towel, food, and most importantly, my TWO medals. I finished. I finished strong. I felt great. No need to stop at the medical tent for ice. After the miserable marathon I ran in January, this felt amazing. I did not PR, but I was only less than 3 minutes off. I put it out there that I was trying for a PR. It helped me push through some tough spots, knowing that I had so many people wishing me luck from all over the place. I will break my 2:09 record someday. 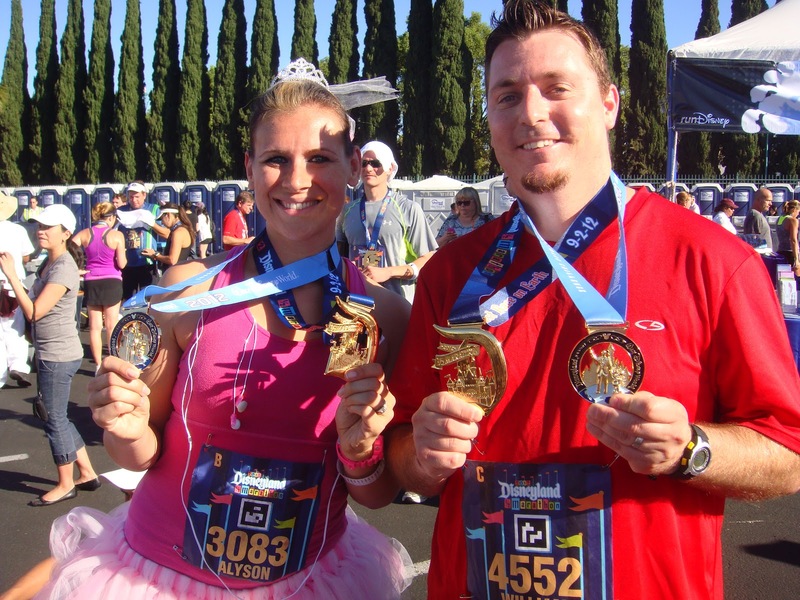 I've read Disney races aren't a great place to run fast; there are just too many people. I'm proud of what I've accomplished. I'm proud of my husband. 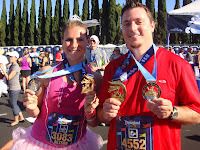 We both walked away health, happy, and with two medals clinking around our necks. After getting my goodies, I went to the family meet-up area. This is actually the first race where we didn't have anyone to meet with other than us. I whipped off my sneakers as soon as I found a spot and changed into flip-flops. My toes needed some air! Billy was soon to follow. We took some photos and watched the winners receive their trophies. We hung around for a few minutes, but it was starting to warm up and we just wanted to shower and start celebrating in the parks. 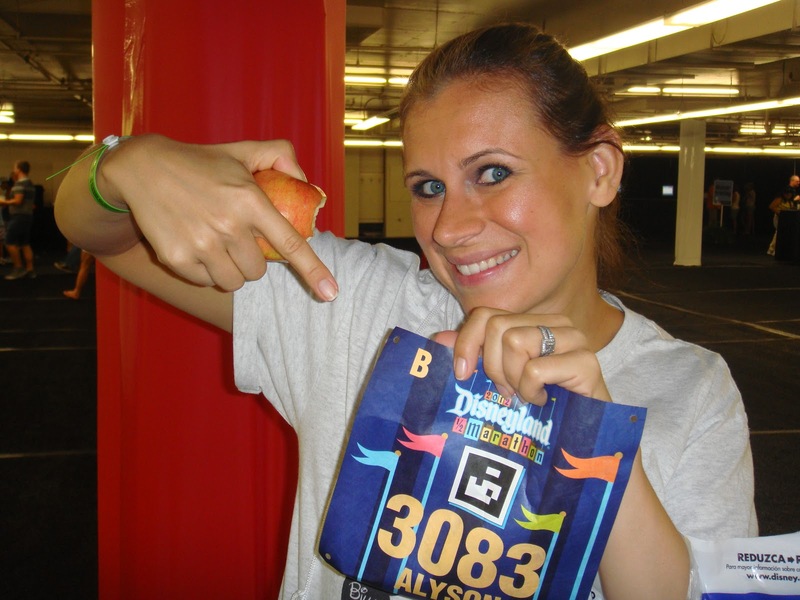 On a side note--I named this blog after my favorite poster at the Disneyland Half Marathon. Just Keep Swimming person...where were you???? I have no idea who this person is, but for that last 2 years, I laughed each time I saw that sign (it's a Finding Nemo reference, if you didn't know). They always stand in the same place. I missed you, stranger, this year!!!! My husband saw her (to be honest, I can't even remember if it is a man or woman) at the usual place, but she wasn't there when I went by. Maybe next year I'll move back in corrals so I can see you! It was a great race. 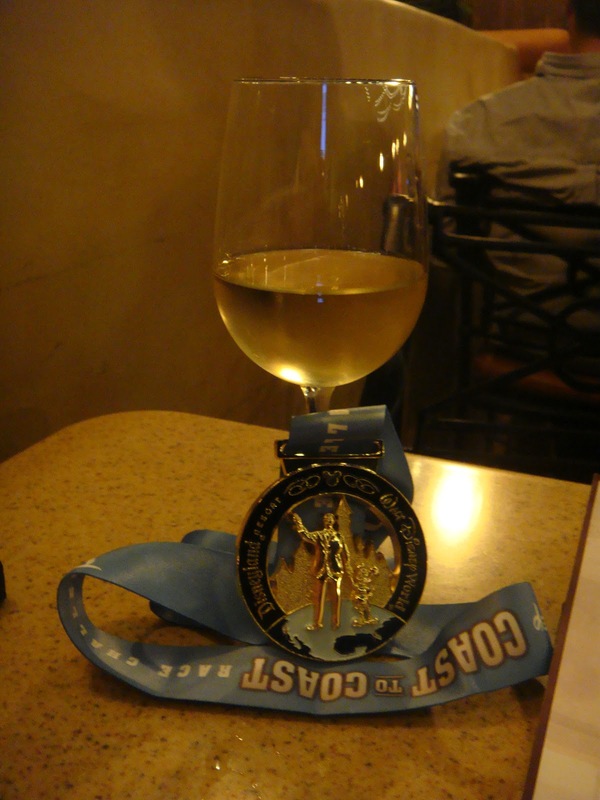 It's a great first half marathon, if you ever considered doing one. I love the bling. I love the course. I love the organization (which could make or break a race). Yes, they are pricey runs, but I never hesitate, because I love to Run Disney!